Pearl sometimes plans to enjoy a quiet life in 1893 for a while but as she goes wandering amongst nature as she loves to do, sometimes she discovers that things are amiss. Like an infestation of huge, bold rats. Not being overly squeamish or one to shirk her civic duty, when she has time she deals with the rat problem. From experience she’s learned that when a zombie is dealt with, another just arises to take it’s place. She knows when to walk away. In the virtual world of Island Oasis, I exchanged my windmill house for a log cabin on my private island. I’ve used up all my prims. Maybe I should swap one of the plants for a rug in here. Sitting up like I’ve had too much caffeine. Sunset and no neighbors on the islands for as far as I can see. Most of my time for virtual worlds is spent in Second Life but I’m also maintaining a home on the grid in Island Oasis. All I need to do to keep the island and home is to log in at least once a week. I check it more often but it can kind of freak me out just a little to realize how fast time goes by when I check the rental box and there’s only a day or two left, especially when it seems like I’ve just checked it. I don’t have nearly as much control as I like to think I do but I have four things that help me stay sane with how time works. #1. I attempt to focus on as few things as possible at one time instead of multi-tasking. #2. I intend to really stay present in the moment and it seems to help time expand. #3. I attempt to overlook and ignore how frequently cyclical things come around– like taxes, holidays, haircuts, logging in to Island Oasis and such–because that tends to give me a distorted sense of time. #4 Much of the world operates on linear time and I go along with that well enough but I’m getting better at knowing when to utilize non-linear time. Maybe what I’ve written about time doesn’t make sense so just forget about it; it helped me to write it. …..but the sim closing in a day is sad instead of amusing. 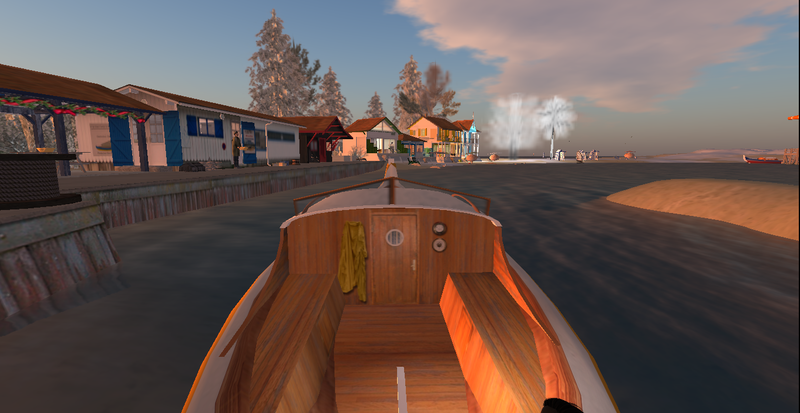 Pearl recently visited the French sim of Arachon Atlantique for the first, and sadly last, time as it’s closing very soon. There was lots to do and not enough time to explore it all in one visit. There are no photos here of the wine making area with spiderwebs and all the farm animals….so many different kinds. We love animals in real and virtual life. [20:25] Match Fishing: You STRIKE! [20:25] Match Fishing: Well done PearlGrey! You landed a 22.1 lb Cod! [20:25] Match Fishing: You release the fish back into the water. [20:25] Match Fishing Trophy Stand: Congratulations PearlGrey Resident!! You got the BIGGEST FISH SO FAR!! [20:25] Match Fishing: PearlGrey makes a good cast and is ready for the next bite! [20:27] Match Fishing: PearlGrey wonders if the fish have gone off this bait. Might be time to switch to a different one? [20:27] Match Fishing: You recast with LUGWORM as bait. [20:29] Match Fishing: Quick PearlGrey, Strike!! You’re gonna lose him! Hit ‘strike’ now! [20:29] Match Fishing: You STRIKE! [20:29] Match Fishing: Oh dear! It must’ve been a small fish. It’s spat out your big hook and heavy line. [20:29] Match Fishing: PearlGrey makes a good cast and is ready for the next bite! [20:29] Match Fishing: Thanks for fishing! Hope you had a good time! Your catch will be transfered to the trophy stand. [20:29] Match Fishing Trophy Stand: Congratulations PearlGrey Resident!! You got the GOLD TROPHY!! Lets hope you can hold on to it until the match ends. There was historical and regional information offered in local chat during the balloon ride. A lot had been put into this sim and I’m glad Pearl got to visit. Finishing the evening with a few drinks. Pearl rests after looking at art. 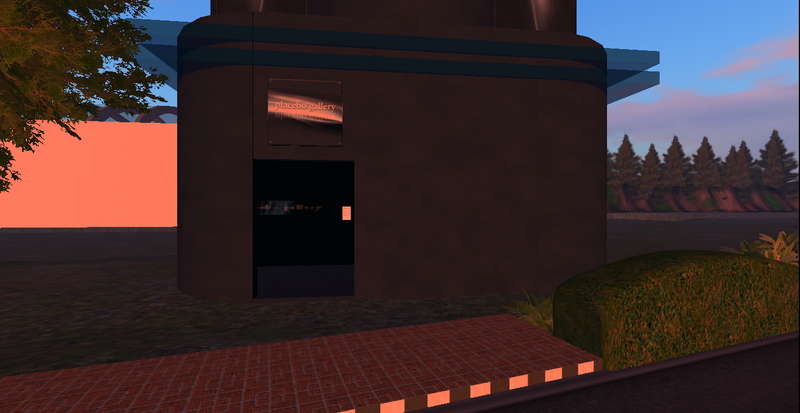 The cyber-grunge roleplay sim I played in last summer has reopened with some changes. After we clean up and repair from a “natural disaster”, I’ll be managing the Golden Dragon Tea House and Bath House again. Pearl will be wearing her version of a year 2070 look instead of Victorian or Medieval/Fantasy for a while. 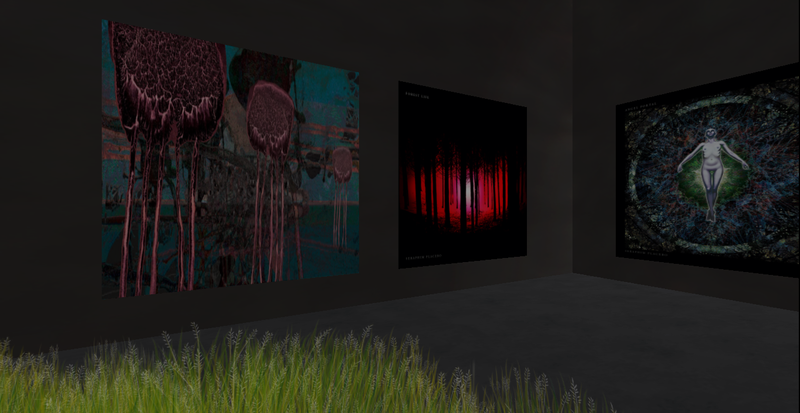 She recently went to the mainland to visit the Placebo Gallery, curated by resident Seraphim Placebo to view the work of an artist and fellow blogger. A lovely world where grass, wildflowers and trees can easily grow inside a gallery. After checking the land impact of some of the pieces (only 1), Pearl purchased the one in the left of the above photo. Really like the bone flowers. 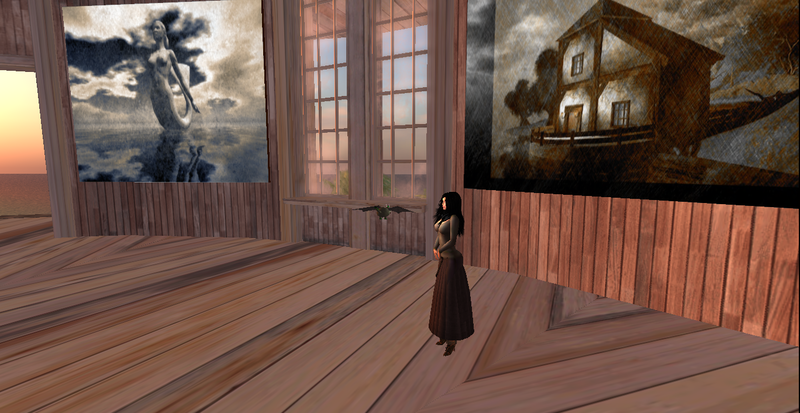 Inworld the gallery can easily be found in search under Placebo Gallery. The gallery is on the mainland. Pearl rarely travels to the mainland and got distracted a little by looking around the immediate neighborhood. She was standing in the middle of the street when amazingly, several residents strolled by. Art Gallery at Miramar. Do you see the little green dragon? Pearl had a few moments and wanted to visit a warm and sunny place to look at some art. I selected a place I’d found through Honour’s blog. She had amazing photographs of the sim. The sun on the water was beautiful, Pearl liked the art and had fun interacting with baby dragons. A good day to visit a more tropical climate. 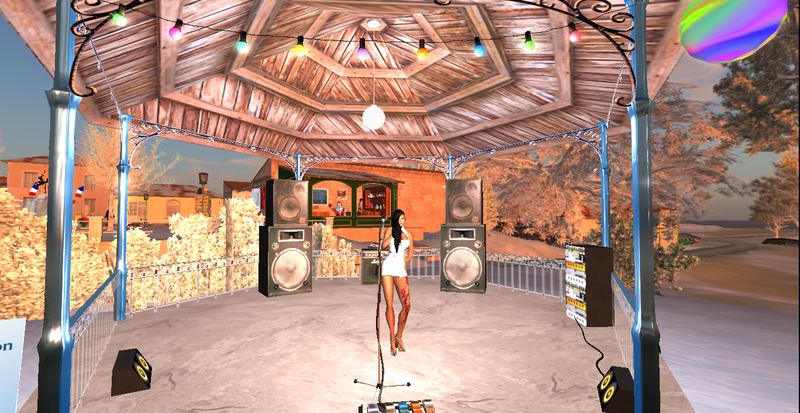 As with many places inworld, there are areas to hang out and talk or dance. When I was there, the Christmas tree was still up. Available space in this gallery but Pearl is enjoying the friendly baby dragon. There are several galleries and not all were filled yet. Pearl wants to visit again in a few months. It’s always enjoyable to visit galleries in pretty settings. 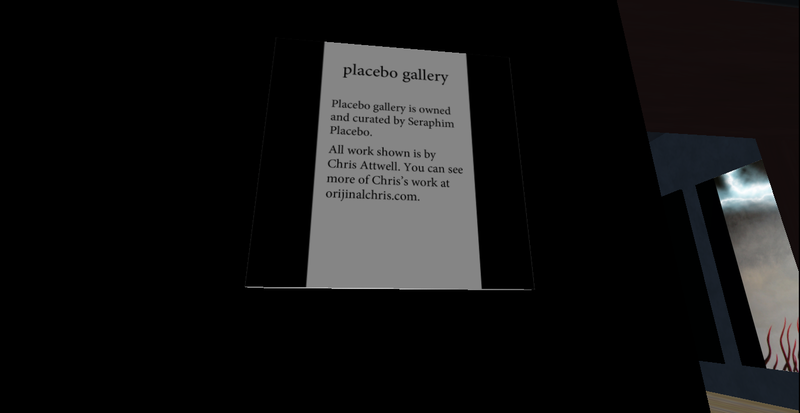 On my list is a visit to the Placebo Gallery again, to take some photos and write about it. It’s been snowing in real life all day. This reminds me of when I first became interested in exploring Second Life. It may be getting smaller and I’m aware of some of the problems but there’s still much to be fascinated and intrigued by. I’ll just pay better attention and log off more quickly when my energy begins to drop for whatever reason. There are changes and progress in Lost Paradise since I last entered that virtual world. Taking a tour, there were new buildings and some new shops under construction. I like the architectural details the best. It appears to be a calm and orderly world, someone’s plan and vision that they’ve followed through on and are maintaining. My vision is quite different; I’m not planning or following through though. Living in the culture I do and spending a fair amount of attention online it seems typical when everyone’s a critic and everyone supposedly gets to have an opinion, that I can give an automatically jaded and hurried glance over someone else’s creativity. Lately as I’m gaining more clarity about what interests and nourishes my soul, I’ve been able to pay attention to my ego’s first response to things. Instead of censoring myself immediately, because my response is unkind, envious, disgusted or whatever, I look at it simply as information. Does my response mean the thing or idea is something I’d like to explore further? Or that it isn’t for me although it’s fine that exists in the world? Or that it isn’t for me right now? I actually practice considering these things and re-frame my criticism/judgement in my mind to a more inclusive and tolerant wording and feeling. How silly and human of me to look down on stuff that other people bring into the world when I’m not even doing something similar. I know for a fact that almost everything I attempt is a lot more difficult, takes longer and costs more than I’d imagined. Hopefully I’ll be paying attention enough to wear a little groove in my new way of looking at things before this gets lost in the immensity of life’s details.